KeyCuff and Double KeyCuff are made of a high quality Nylon 6 resin designed for exceptional strength and endurance. With its tactical black color, it is highly resistant to UV rays. However, for best performance do not leave in the sun. All Nylon 6 products will degrade if left in the sun. They dry out and crack. In your vehicle store them on the floor, next to the seat or in the trunk. Air conditioning will dry out all plastic products. If you notice the product looking dry, soak them in hot water from a tap for one hour, then dry them off. They will seem soft, but they are strong. The KeyCuff head is designed to be used with a standard handcuff key. Loop the strap and pull tight. You should hear a nice clicking sound from the strap. To release, insert the handcuff key in the slot and turn clockwise while moving your hand to the right. With a couple of practice tries this will become second nature. The reason for this is that we designed the strap so it would not spring open. You have to move your hand to the right to make it open. Officers we worked with said this is safer. You should not have to turn the key very hard to get the strap to move. 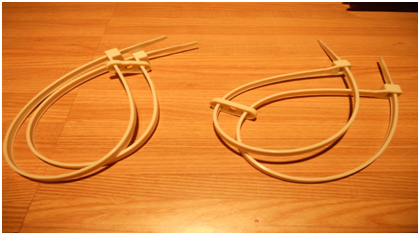 For Double Keycuff we do not preload the connectors because there are two ways to use them. The connector can be moved down the strap to the head, where there is a “shoulder”. You can move the connector over the shoulder and snap it in place. Try this to see if you like the connector this way. The other way to use the connector is to keep it loose on the strap. Many officers prefer this method. But it is up to you to choose which way you want to use the product. Write us and tell us what you think of each way. Low cost per use of 33 cents or less. Releases or adjusts with a standard handcuff key. Prevent injuries. No cutting tool needed. Each strap has a tensile strength of 350 pounds. Connector allows for easy folding and carrying. Can be used on legs. Length: 21", Width 0.35"